The first in a successful series of slasher flicks, Wes Craven’s Nightmare on Elm Street graced us with a small role by a giant star…Take a close look, do you see? No, not Johnny Depp, I was referring to that GE behind him. Dubbed “The Blockbuster” back in ’83, it’s the 3-5259. Thanks Dwayne for the capture. Mike from Moscow, Russia provided a terrific pic of one of the rarest and biggest Panasonics of all time, the RX-5350. 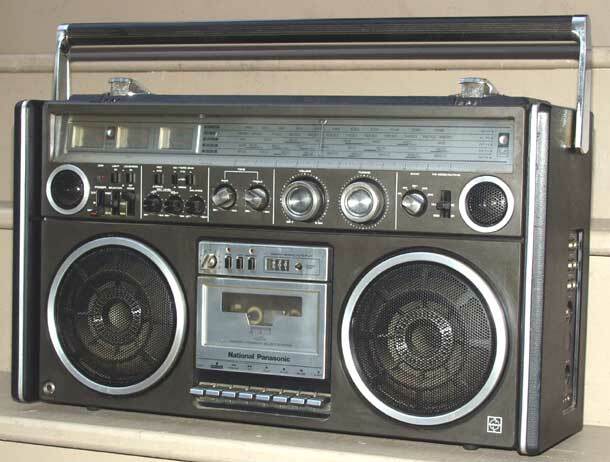 It offers 8″ speakers, a five-band equalizer and requires 10 D batteries for its big sound. The model appeared briefly in 1983. Thanks to Andy in the UK for providing us a shot of his Sharp GF-525. AM/FM/SW/LW tuning, twin cassettes, Sharp’s automatic music search system and cross fader make this a rare model indeed, especially in this condition. Thanks Andy! Obtaining this stereo was a big achievement for me, it was one I’ve wanted for several years. It’s a National RS-4360 but is identical to the Panasonic RX-7700. 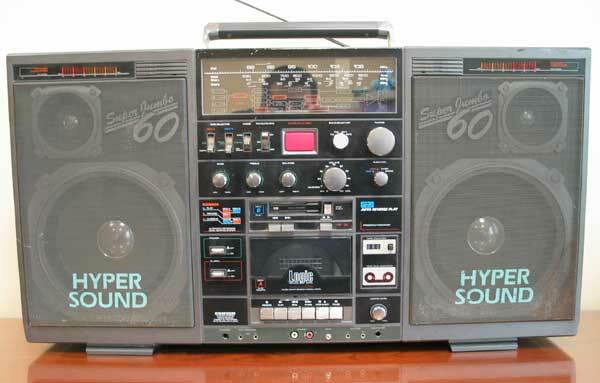 I love the sound on this stereo and the incredible reception. The little stereo mics up top are aluminum and flip up with the touch of a button. The tuning knob is weighted and feels much like a home receiver. This radio will sit in my office at home to be enjoyed for years to come. Rich in the UK has an impressive stereo collection and is quite knowledgeable. You might bump into him in the Boombox Message Forum. 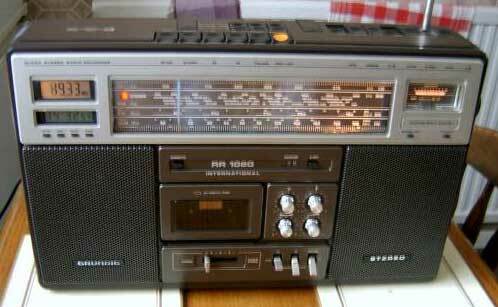 Here’s a picture of his gorgeous Grundig RR-1020, a radio enthusiast’s dream. This one appears to have an analog and digital readout! Like other Grundigs of the day this has frequency presets so you can access your favorite station at the push of the button. 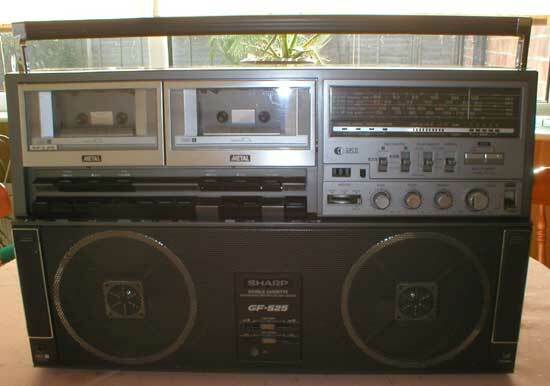 Very high tech for an early ’80s stereo cassette. 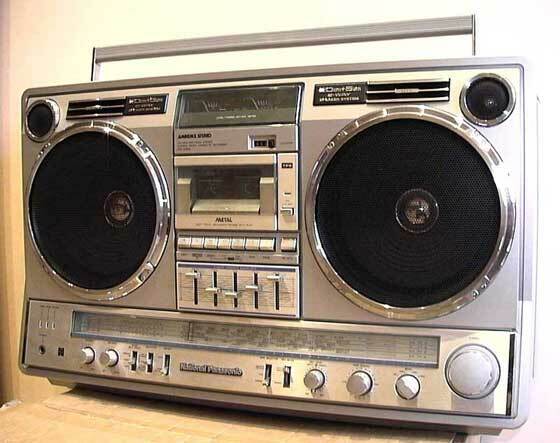 Perhaps one of the most innovative (read: useless) boomboxes is Aiwa’s <i>Rusuban</i> CS-TW80. 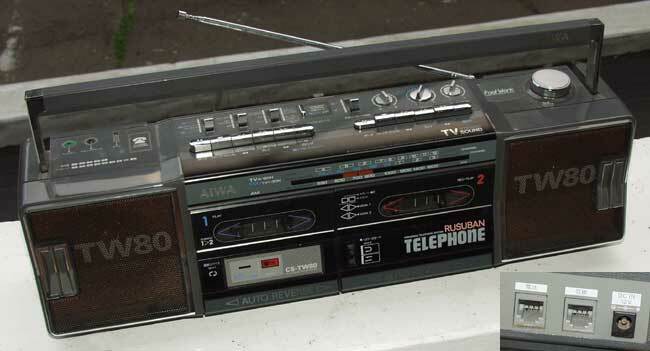 This sleak little model from 1987 was equipped with AM/FM and TV sound, dual cassettes and two RJ-45 jacks in the back. What for? For the telephone answering system, of course! 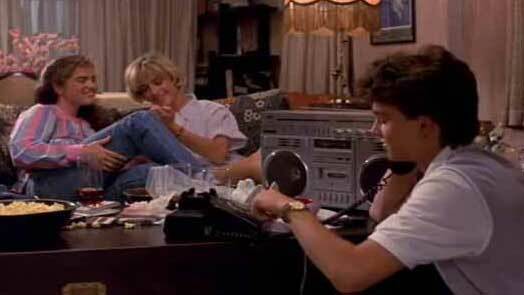 That’s right, the CS-TW80 connected to your phone line to record incoming calls onto cassette. Jimmy in Montreal wandered into a pawn shop on a whim one evening and look what he found! This is a relative of the notorious Conion C-100F, offering all of the bells and whistles of its predecessor in a gray cabinet. 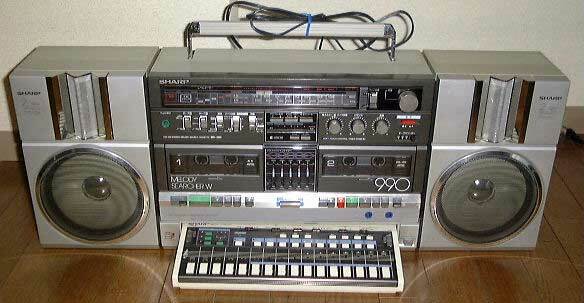 Sharp was gutsy in their boombox experimentation, an example being the MR-990. The interface in the bottom center is a keyboard! If you’re an ’80s synthesizer enthusiast, look for one of these to make your collection complete. Thanks go to Rick in New Hampshire for providing a photo of this exotic piece. Burn in Canada provided a shot of his cool Yamaha PC-8. This thing just reeks of ’80s appeal, doesn’t it? AM/FM tuner, five-band eq, slider controls for volume and balance and logic controls. Use it for tunes as your riding your Yamaha motorcycle or jet-ski, or record a sample from your Yamaha DX-7 synthesizer keyboard.